Help CCE build on our success, and support our campaigns to protect public health and the environment in NY and CT. Make a contribution today. CCE joined Senate Majority Leader Stewart-Cousins, Senator Kaminsky and Assemblyman Englebright in support of two critical bills; one banning offshore oil and gas drilling in New York’s waters, and another protecting Menhaden (bunker fish), the fish that whales rely on for a primary food supply. These bills have passed the Senate and Assembly and we are looking forward to Governor Cuomo signing them into law. We thank the Senate and Assembly champions for their commitment to defending NY’s ocean and wildlife. Congress has passed an appropriations bill funding the Long Island Sound at a record $14 million, plus an addition $600,000 through the National Estuary Program! This is not only a much-needed $2 million increase over last year’s funding but also comes after President Trump proposed to completely defund the Long Island Sound program in his 2019 budget. The Great Lakes Restoration Initiative (GLRI) was once again funded at $300 million, allowing efforts to clean up toxic hot spots, restore habitat, and fight invasive species to continue. A huge thank you to our House and Senate champions who stood with the public and stakeholders and fought for this critical funding. The Hamden Legislative Town Council has voted yes to a ban on single-use plastic bags and to ban plastic straws at food service establishments throughout town! This makes Hamden the most recent in a growing list of Connecticut municipalities taking action to curb pollution from single use plastics and make the switch to reusable products. On the state level, we attended a BYOBag press conference at Compo Beach in Westport with Surfrider, BYOCT, the CT Food Association and a bi-partisan group of Legislators including Rep. Steinberg, Rep. Lavielle, Rep. Michel, Senator Haskell and Senator Hwang . This event marked the historic 10 year anniversary of the Westport plastic bag ban and highlighted this year’s push for statewide bag ban. Environmental Protection Fund Lobby Day: For the past 26 years the Environmental Protection Fund (EPF) has invested billions in projects that protect clean water, conserve open space, save family farms, protect our oceans and Great Lakes, and much more. Governor Cuomo included $300 million for the EPF in this year’s Executive Budget. CCE joined our coalition partners in Albany to urge our elected leaders to ensure at least $300 million for the EPF in the final state budget. Clean Water Day: A broad coalition of organizations made up of water suppliers, waste water treatment operators, government agencies, environmental organizations, academia, construction contractors and other water stakeholders came together in Albany for our Clean Water Coalition Breakfast. After breakfast, we met with legislators from Buffalo to Montauk to discuss the immense clean water needs of New York. 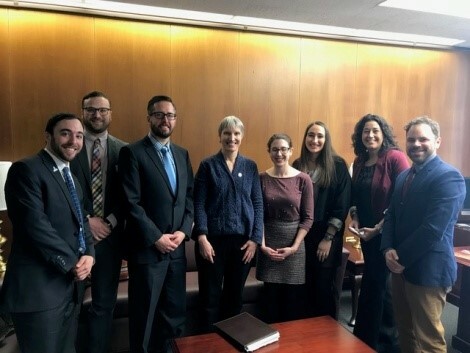 Oceans and Great Lakes Lobby Day: CCE joined the New York Ocean and Great Lakes Coalition to request $17.25 million for the Ocean and Great Lakes Program as part of a $300 million Environmental Protection Fund (EPF). The funding goes toward various initiatives to protect our ocean and Great Lakes, including whale and turtle monitoring programs, ocean acidification research, and resiliency initiatives along the Great Lakes coast. In early February, we testified Connecticut General Assembly Environment Committee in support of bills to permanently ban hazardous fracking waste, require gas companies to limit methane gas leaks, and prohibit the release of helium balloons. Later in the month, CCE’s Louis Burch participated in a legislative panel discussion at the CT Recyclers Conference in Plantsville, CT. We highlighted some of our key solid waste reduction goals, including eliminating plastic bags, expanding the Bottle Bill (include a deposit on additional beverage containers), and implementing curbside food waste collection. We joined U.S. Senator Chuck Schumer for a press conference at our Farmingdale office to call on the EPA to regulate PFOA and PFOS, two possible carcinogens that have been found in drinking water supplies throughout the state. While NYS has recommended strict drinking water standards for these contaminants, it is critical that the federal government act to ensure the public is protected from these emerging contaminants. You can watch the press conference here. The NYS Senate held a series of public hearings on the Climate and Community Protection Act, which aims to codify aggressive carbon reduction and renewable energy targets into law, ensure a just transition to renewable energy for workers and communities, and protect vulnerable coastal communities. CCE testified on Long Island, highlighting the necessity of offshore wind, large scale solar projects, and the importance of closing our outdated fossil fuel plants. Watch CCE’s Adrienne Esposito testify here. We also testified in Syracuse, focusing on how climate change impacts the frequency and severity of harmful algal blooms, contributes to the proliferation of mosquitoes and other disease-bearing insects, and puts additional stress on farmers, their crops and livestock. We are an active member of the HeatSmart CNY campaign, which has been working to help CNY residents and businesses install modern, clean geothermal systems. HeatSmart CNY is a grassroots community initiative to support residents and businesses in exploring ways to improve the efficiency of their buildings, including air source, ground source, and hot water heat pump technologies. To learn more about geothermal technologies, join us at upcoming HeatSmart events. If you own a home or business in Cayuga, Cortland, Madison, Onondaga, or Oswego Counties, you can sign up for a free, no obligation energy assessment! At the local, state, national level—we are all experiencing a solid waste and recycling crisis. We are facing waste challenges across NYS, but we also have chance for new opportunities; a chance for new solutions, new policies, and a renewed focus on reducing our waste stream and making our communities more sustainable. CCE staff participated in the NYS DEC’s Solid Waste Management Plan stakeholder meetings to develop a new vision for handling the state’s waste. We stressed the need for increased education to “Recycle Right (only recycle what is actually recyclable! ), an expanded and modernized the Bottle Bill (to include a deposit on additional beverage containers), banning plastic bags (with a fee on paper), a program to utilize extra food from large food generators (e.g. restaurants, supermarkets, institutions) for composting, anaerobic digestion, and to feed the hungry. Throughout 2018 we hosted a series of forums highlighting the importance of reducing nitrogen pollution from outdated septic systems and cesspools. We will be helping residents secure grants to change out their old systems for new, on-site, nitrogen-reducing treatment systems through Suffolk County's Reclaim Our Water program. We continued the series in 2019 with presentations in Holbrook, Port Jefferson, and Port Jefferson Station. Our March presentations will be at Bayport-Blue Point Library on March 7 at 7pm and at Connetquot Public Library on March 19 at 7:00pm. We hope to see you there! $2.5 billion in clean water infrastructure funding. Increasing NY's renewable energy goal to 70% by 2030, and carbon-free electricity by 2040.•Increasing NY's offshore wind goal to 9,000 megawatts by 2035. Banning plastic bags and expanding the state's bottle deposit to additional beverage containers.•$300 million for the NYS Environmental Protection Fund. Banning offshore drilling in NY's waters. CCE's Adrienne Esposito testified at the Legislature's budget hearing to ensure that these and other priorities are strengthened and make it into the final state budget. We will continue pushing these and other important policies, including banning 1,4-dioxane from consumer products, protecting menhaden (a fish species crucial to whale survival), fighting climate change, and more throughout the 2019 legislative session. Suffolk County Residents Vote Yes for Sewers! In January, the Carlls River and Forge River sewering projects were approved with 73% of the vote! In the largest sewer expansion on Long Island since the1970's, 6,500 homes in Mastic and Babylon will be connected to sewers, greatly reducing nitrogen entering our local waterways. A huge thank you to all the Suffolk residents who came out and voted for clean water. We're looking forward to seeing improved water quality, healthier fisheries, and less harmful algal blooms thanks to these much-needed sewering projects. As a member of the environmental policy subcommittee, we briefed Governor Lamont and his transition team on key issues in CT, including eliminating single-use plastics, expanding food waste composting, and improving the state's recycling system. We look forward to advancing these and other key priorities in CT this year! 1,4-Dioxane is hidden carcinogen lurking in an estimated 46% of personal care products, but it is not listed on their labels. Last year, we had 30 baby products, detergents, shampoos and body washes tested for the contaminant. Unfortunately, 23 out of the 30 products contained 1,4-dioxane. After releasing a report on these results, we received calls from the public asking us to test additional items, including generic and discount brands. We just sent an additional 50 products to a certified lab to be tested for 1,4-dioxane. The results will be coming this spring along with a shopper's guide of all 80 tested in total, so stay tuned! Central NY: Stay Warm This Winter with Geothermal! New York waters are already showing signs of ocean acidification. This is the result of greenhouse gas emissions combined with polluted runoff from land. This acidity can negatively impact shellfish, finfish, and other marine organisms. The New York Ocean Acidification (OA) Task Force was established to ensure that the best available science is used to assess and respond to this emerging threat to New York's marine waters and fisheries. CCE attended the January task force meeting, and we will continue to monitor the task force and look forward to its plan on how to address ocean acidification in New York waters. In January, the Town of East Hampton passed a ban on polystyrene foam containers (commonly called Styrofoam)! The Town is also considering banning the intentional release of balloons. Meanwhile, in Southampton, we testified at a public hearing last month to ban polystyrene and plastic straws. These crucial efforts will curb single-use plastics polluting our beaches, bays, and ocean on the South Fork. Upcoming: Support a Healthy Environment and Healthy Economy at EPF Lobby Day! A clean, healthy, and thriving environment is the backbone of economic development throughout New York. For the past 26 years, the Environmental Protection Fund (EPF) has invested billions to protect and restore our precious environment in every region of the state. Governor Cuomo included a fully-funded EPF at $300 million in this year's Executive Budget. This funding will support capital projects that protect clean water, conserve open space, save family farms, revitalize waterfronts, protect our oceans and Great Lakes, and much more. Join us in Albany on February 12 for the annual EPF Lobby Day and help us fight for a fully-funded EPF in the final state budget! Register for the EPF Lobby Day. Throughout 2018 we hosted a series of forums highlighting the importance of reducing nitrogen pollution from outdated septic systems and cesspools. We will be helping residents secure grants to change out their old systems for new, on-site, nitrogen-reducing treatment systems through Suffolk County's Reclaim Our Water program. We continued the series in 2019 with presentations in Holbrook and Port Jefferson Station. Our next forum will be at Connetquot Public Library on March 19 at 7:00pm. We hope to see you there! Our Connecticut Program Director Louis Burch was invited by Governor-Elect Ned Lamont's transition team to participate in its environmental policy subcommittee. We are helping to identify and outline the new administration's top priorities regarding solid waste and recycling, including eliminating single-use plastics (e.g., bags), improving public education on recycling, expanding curbside food waste composting, and modernizing CT's Bottle Bill. The subcommittee unveiled its priority recommendations at a public meeting in December. NYS Drinking Water Council Recommends Toughest Standards in the Nation for Emerging Contaminants! We were thrilled to attend a press conference in December where Governor Cuomo announced a new goal to launch a "Green New Deal" and achieve zero carbon emissions in the electric sector by 2040. This effort builds on his 50% renewable energy by 2030 and offshore wind goals and presents a big opportunity to finally transition away from polluting fossil fuels and embrace renewable energy statewide. We look forward to learning more about the Green New Deal and fighting to advance good wind, solar, and other renewable projects. In December, we received a grant from Long Island Sound Futures Fund focused on preventing plastic pollution entering Long Island Sound. We'll be working in Nassau and Suffolk communities to educate the public on going strawless and conducting coastal cleanups, so stay tuned for more! We are an active member of the HeatSmart CNY campaign, which has been working to help CNY residents and businesses install modern, clean geothermal systems. HeatSmart CNY is a grassroots community initiative to support residents and businesses in exploring ways to improve the efficiency of their buildings, including air source, ground source, and hot water heat pump technologies. To learn more about geothermal technologies, join us at upcoming HeatSmart events. If you own a home or business in Cayuga, Cortland, Madison, Onondaga, or Oswego, you can sign up for a free, no obligation energy assessment! From 2010 to 2017, water costs increased 41 percent across the country as water shutoffs also increased. As we work to make investments in protecting drinking water, we are also working to ensure that water remains affordable, particularly to low-income residents. In December, CCE's Brian Smith testified at a City of Buffalo Water Board hearing calling for a robust water affordability program. We commend the Water Board for moving forward with a program to provide low-income residents with a credit to ensure that their water bills don't increase in the short term; however, we recognize that this is only a first step and more needs to be done to ensure that water rates remain affordable in the years to come. In 2018—with your help—we passed the monumental NYS Drug Take Back Act, which will require the pharmaceutical industry to fund a robust, statewide drug take-back program to keep drugs out of our waters and prevent drug abuse. While the law begins to take effect on January 6, 2019, much work remains to ensure that the program is effectively rolled out throughout 2019. In December, we attended a meeting held by the Governor's office and called for the program to provide convenient access to drug drop boxes for every community throughout the state. Throughout 2018 we hosted a series of forums highlighting the importance of reducing nitrogen pollution from outdated septic systems and cesspools. We will be helping residents secure grants to change out their old systems for new, on-site, nitrogen-reducing treatment systems through Suffolk County's Reclaim Our Water program. We'll be continuing the series throughout the winter and spring of 2019, and our next forum will be at Sachem Public Library on January 14 at 7:00pm. We hope to see you there! Forge River: January 8, 11:00am and 7:00pm, Mastic Fire Department, 1080 Mastic Road, Mastic, NY. Carlls River: January 10, 6:00pm, North Babylon Volunteer Fire Company, 20 Hale Road, North Babylon, NY. Connetquot River: January 18, 7:00pm, Timber Point Elementary School, 200 Timber Point Road, East Islip, NY. The U.S. Army Corps of Engineers is creating a plan to combat future flooding in the New York metropolitan area, which could include massive storm barriers spanning New York Harbor, Western Long Island Sound, and other bays and tributaries. These storm surge barriers could permanently alter the landscape and health of these waterbodies and flood coastal communities in Long Island, Connecticut, and Westchester. They would also do nothing to address the real issue of climate change! In October, we worked with Congressman Tom Suozzi to get the Army Corps to hold a public meeting about its plan on Long Island. Prior to the meeting, we held a press conference with our partners at Save the Sound, Manhasset Bay Protection Committee, Hempstead Harbor Protection Committee, Coalition to Protect Hempstead Harbor, and Friends of the Bay to raise concerns about this "Gates from Hell" proposal. Want to get the latest on cutting edge environmental issues from the person fighting for all of us 365 days a year? Adrienne Esposito is now hosting a radio show on WCRN 103.9 on the first Friday of the month at noon. The show premiered on October 5, and we just had another great show on November 2, featuring Carl LoBue from The Nature Conservancy discussing ocean protection. Tune in next month for more Earth Witness News! We were pleased to organize a tour, led by our friends at PUSH Buffalo, of green infrastructure projects in the City of Buffalo. Green infrastructure is a network of decentralized stormwater management practices, such as rain gardens, green roofs, trees, and permeable pavement, that can capture and infiltrate rain where it falls. Not only is this reducing polluted runoff and sewage overflows that can pollute Lake Erie, but it is beautifying neighborhoods and creating training and employment opportunities for the community too! Long Island's energy demand is stable, and PSEG has announced that renewable energy, not fossil fuels, is the most cost-effective and reliable way to meet the island's future energy needs. Despite there being no need for this project, the Town of Brookhaven has decided to allow Caithness to move forward with a 600 MW fossil fuel plant. This project will worsen the already poor air quality in Suffolk County and stifle efforts to transition to wind and solar. In October, we joined our partners in the Stop Caithness II Coalition for a press conference and rally, and then headed into Town Hall where we testified in opposition to this unnecessary, polluting power plant. CCE is a member of the Reusable Bag Alliance in Connecticut, a coalition made up of local groups working together to pursue a statewide plastic bag ban in 2019. In October, the Coalition met to discuss the problem of plastic pollution, existing strategies for encouraging reusable bag use, and potential bag ban legislation. The coalition includes members from BYO Greenwich, BYO Stamford, Citizens Campaign for the Environment, the CT Food Association, and several other statewide and local environmental groups. Stay tuned for more info on how you can help get a statewide BYOBag bill passed in 2019! CCE, along with our partners in the South Shore Estuary Reserve, hosted the SSER Boat Tour and Stewardship Awards aboard the Lauren Kristy on the Great South Bay. Mr. Scott Bochner was honored for his dedication to protecting and restoring the Western Bays, fighting to upgrade the Bay Park Sewage Treatment Plant, and consistent efforts in removing marine debris from the SSER. The other awardees were Mr. George Remmer and Mr. Richard Remmer, of the Snapper Inn, for their dedication to supporting the restoration of the South Shore Estuary Reserve, contribution to needed water quality monitoring, and generously providing resources to assist in protection efforts. In October, we cosponsored and participated on a panel that asked questions in a debate between District 1 Congressman Lee Zeldin and his challenger, Perry Gershon. We found out where each candidate stands on critical Long Island environmental issues, including Plum Island protection, opposing offshore drilling, fostering renewable energy development, and reducing pollution to our ground and surface waters. CCE is fighting for a health-based NYS drinking water standard for 1,4-dioxane, a likely carcinogen that has been detected at high levels in Long Island wells. Not only do we need to ban 1,4-dioxane in personal care products, but we need to treat the existing contamination to protect public health as well. In October, we attended a meeting of the NYS Drinking Water Quality Council to continue discussions on setting a state standard for 1,4-dioxane and PFOA, two emerging contaminants that are polluting drinking water in NY. We are calling for a health-based drinking water standard by the end of the year. The NYS DEC has proposed a cleanup plan for a portion of the DZUS superfund site on Long Island, located in West Islip. We attended the public meeting and submitted comments calling on the DEC to improve the proposed cleanup plan, which would remove only 19,000 cubic yards of sediment. We support Alternative 3, which provides the most comprehensive cleanup for this site. Alternative 3 will remove all of the contaminated sediment—24,000 cubic yards—at a cost of only $2 million dollars more than DEC's proposal. Seventh Annual "Water We Going to Do?" The Long Island Clean Water Partnership held our annual "Water We Going to Do?" Conference in October. We heard our federal, state, and local officials, as well as scientific experts, give updates on Long Island's fight against nitrogen pollution and other impairments facing our water resources. Keynote speaker Dr. Christopher Patrick offered some hope for our own waters as he discussed the success of the Chesapeake Bay restoration project. Thanks to everyone who turned out and made it our best conference yet! Over the summer and fall, we have been hosting a series of forums highlighting the importance of reducing nitrogen pollution from outdated septic systems and cesspools. We will be helping residents secure grants to change out their old systems for new, on-site, nitrogen-reducing treatment systems through Suffolk County's Reclaim Our Water program. So far, we have held forums for residents of Huntington, Smithtown, Centereach, Cold Spring Harbor, and Riverhead, and have received a great response. Our next forum is at East Northport Public Library on November 29, and we hope to see you there! CCE is fighting for a health-based NYS drinking water standard for 1,4-dioxane, a likely carcinogen that has been detected at high levels in Long Island wells. Not only do we need to ban 1,4-dioxane in personal care products, but we need to treat the existing contamination to protect public health as well. The NYS Drinking Water Council, which is charged with creating a drinking water standard for 1,4-dioxane, has yet to take action. In September, we joined NYS Senators Hannon, Marcellino, and Phillips to call on NYS to set a health-based drinking water standard and mandate the removal of this harmful chemical from our drinking water. • Victory! Ulster Becomes First NY County to Ban Plastic Bags: The Ulster County Legislature passed a ban on single-use plastic bags, along with a 5-cent fee on paper bags, to incentivize people to BYOBag (bring your own bag). A huge thank you to Legislator Tracey Bartels and the other bill champions, who worked for years to pass a very strong BYOBag bill. Next up in Ulster: reducing plastic straws! • Victory! Stamford, CT Bans Plastic Bags: The Stamford Board of Representatives voted yes to ban single-use plastic bags and place a 10-cent fee on paper bags! Thank you to our partners at BYO Stamford and the hundreds of people who called their legislators this September in support of the bill. • Combating Plastic Microfibers in CT: We participated in the first meeting of the Connecticut Microfiber Working Group, a consortium of apparel industry professionals, environmental advocates, and academics working to identify the most common sources of plastic microfiber pollution and create a consumer awareness and education campaign about the problem. Up to 1.7 million tons of microfibers—often coming from clothing—enter our environment every year! We can get ahead of this problem, but the time for action is now. • Cleaning Up the Patchogue River: We joined the National Park Service and Village of Patchogue, NY for their annual river cleanup. Although BYOBag bills in Patchogue and Suffolk (along with the polystyrene ban in Patchogue) have helped reduce plastic litter, we still have a lot of work to do to prevent plastic pollution, and cleanups are still needed. CCE and our partners the Long Island Clean Water Partnership joined Dr. Chris Gobler for our end of summer report on the state of Long Island's waters. Unfortunately, harmful algal blooms plagued our bays and estuaries and posed a growing threat to our fisheries, beaches, and public health once again. Excessive nitrogen from sewage and septic systems continues to degrade our waters, but there is some good news. In some areas where nitrogen pollution has been significantly reduced, like Western Long Island Sound, we are seeing improved water quality and decreased hypoxia! If you missed it, you can still watch the whole press conference. A new study by the University of Michigan showed that investments in the Great Lakes Restoration Initiative (GLRI) have resulted in a more than 3-1 return on investment. Not only is the GLRI making our lakes healthier, but it is also contributing to increased waterfront development, tourism, and home values, which all benefit the economy. The study looked at the City of Buffalo and found that Great Lakes restoration is estimated to provide more than a 4-1 return on investment in the decades to come! In September, we continued to fight for full funding of the GLRI, despite attempts by the President to slash funding for the critical program. CCE's Louis Burch was elected to the Connecticut Recycling Coalition (CRC) board at the CRC's annual business meeting in Branford, CT. CRC's membership includes corporate, municipal, institutional, and private members working to advance Connecticut's recycling and materials management programs and services on both the local and state levels. Formed in 1989, CRC assists members in improving the efficacy of their own programs, educating the community and advocating policies and programs that make recycling more effective, economical, and robust throughout the state. We're excited to join the CRC and advance recycling in CT! In September, CCE joined our partners in Long Island water protection for Estuary Day at Seatuck Environmental Association in Islip. The event brought together diverse groups to celebrate the beauty and natural resources of Long Island's Estuaries of National Significance. The public had an opportunity to participate in a coastal cleanup, wildlife hikes, and information sessions to learn more about our local communities' efforts to protect Long Island's coastal waterways. We were delighted to collaborate with Cornell Cooperative Extension to give a presentation on our Sound Gardening program, with information on how homeowners can make landscaping choices that better protect Long Island's water for the future! This summer, Governor Cuomo announced that NYS will be procuring 800 MW of offshore wind by 2019 as part of the State's goal of reaching 2,400 MW by 2030. Last month, CCE joined our environmental and labor partners at meetings held by NYSERDA in NYC and Long Beach to learn more about the plan to bring offshore wind to NY. Before the Long Beach meeting, we joined Senator Todd Kaminsky for a great press conference on the need to move forward with responsibly-sited wind projects and move away from fossil fuels. At a ceremony held at Gotham Hall, in New York City, HSBC Cares awarded CCE Executive Director Adrienne Esposito with its Customer of the Year for Environment Award. HSBC Cares is a program by HSBC Bank that recognizes community heroes. Adrienne was recognized as an HSBC customer who has made a significant contribution to protecting communities against environmental threats that imperil our air, water, and land. Over the summer and fall, we have been hosting a series of forums highlighting the importance of reducing nitrogen pollution from outdated septic systems and cesspools. We will be helping residents secure grants to change out their old systems for new, on-site, nitrogen-reducing treatment systems through Suffolk County's Reclaim Our Water program. So far, we have held forums for residents of Huntington, Smithtown, Centereach, Cold Spring Harbor, and Riverhead and have received a great response. Our next forum is at East Northport Public Library on November 29, and we hope to see you there! After years of suffering health impacts and diminished quality of life due to unbearable odors from the Brookhaven Landfill, community members, teachers, and parents have filed a lawsuit against the Town. CCE joined plaintiffs and lawyers at a press conference announcing that 25 plaintiffs filed a Notice of Claim, which means the Town has 90 days to respond before the lawsuits get filed in NYS Supreme Court. This action is an act of last resort because the Town has ignored requests to meet. At Frank P. Long School, 35 out of 105 staff members have been diagnosed with cancer. As summer ends we are gearing up for the 2019 budget and urging our NYS leaders to push for critical funding and legislation to protect Long Island Sound. We attended a public hearing held by NYS Assembly Members Englebright and D'Urso in August focusing on improving water quality in Long Island Sound. 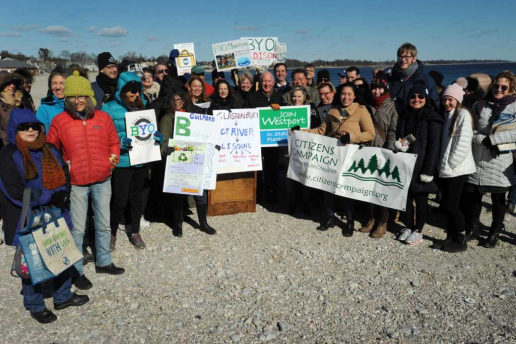 CCE pushed our NYS leaders on Long Island Sound to champion priority legislation, including banning 1,4-dioxane in products, allowing Nassau and Suffolk Counties to create reoccurring revenue streams for sewage and septic upgrades, prohibiting offshore drilling, funding water quality monitoring in North Shore embayments, and passing a comprehensive Bring Your Own Bag bill to prevent plastic pollution. August was a busy month in our work to fight back against federal rollbacks to policies that protect public health and the environment. We weighed in against EPA's ill-conceived proposal to repeal the Clean Water Rule, which was established in 2015 to protect the streams and wetlands that support drinking water for 117 million Americans. We also opposed a proposed EPA policy that would restrict the use of sound science when establishing or evaluating policies, which in practice would make it easier for EPA to weaken or repeal regulations thoughtfully crafted to address a variety of key issues from climate change, to pesticides, to protecting children from lead in paint. Connecticut is the epicenter of the U.S. reverse-vending industry, and CCE and our partners are committed to modernizing the state's bottle bill in 2019! In August, CCE and other members of the Connecticut Recyclers Coalition took a tour of Envipco's headquarters in Naugatuck. We got a firsthand glimpse of the company's state of the art manufacturing facility and an opportunity to check out the newest advancements in container-redemption technology. CCE joined tens of thousands Long Islanders at Alive After 5 in Patchogue this August for a great night of food, drinks, and live music. We joined our partners in the fight against plastic pollution to educate the public on the threat single-use plastics pose to marine life and urged people go plastic-free with pasta straws, reusable utensils, and reusable bags. Thanks to all of our partners at the event, who came with great games for kids, live animals, and giveaways. Patchogue has already banned plastic bags and polystyrene, but we can all still remember to #skipthestraw and stop using other single-use plastics to protect our lakes and bays! In Syracuse, we joined the discussion of potential policy approaches and strategies to bring about a cleaner and more resilient transportation future in New York. The NYSDEC, NYSERDA, and NYSDOT held regional stakeholder discussions to encourage conversations about clean transportation. We discussed the need to reduce climate change emissions, expand access to electric vehicles, and curb harmful air pollution from transportation. CCE was pleased to join Governor Andrew Cuomo to witness the creation of an artificial reef in a 744-acre site off the south shore of Long Island. New York State is embarking on the largest artificial reef expansion in state history, expanding a total of 12 artificial reefs, which include two reefs in Long Island Sound, two in the Great South Bay, and eight in the Atlantic Ocean. The reef expansions are made out of recycled structures including rock, concrete, and steel, which settle to the sea floor and create new habitat for larger fish like blackfish, black seabass, cod, and summer flounder, as well as encrusting creatures like barnacles, sponges, anemones, corals, and mussels. We're excited to see how these recycled structures create habitats similar to natural reefs over time. Over the summer and fall, we are hosting a series of forums highlighting the importance of reducing nitrogen pollution from outdated septic systems and cesspools. We will be helping residents secure grants to change out their old systems for new, on-site, nitrogen-reducing treatment systems through Suffolk County's Reclaim Our Water program. So far, we have held forums for Huntington and Riverhead residents and have received a great response. Our next forum is at Smithtown Library at 7pm on September 24, and we hope to see you there! We were thrilled to participate in the signing of a Suffolk County resolution that will appropriate $1 million toward the completion of the Carmans River Fish Ladder Project, which will open up the last remaining barrier to fish passage on the Carmans River in Yaphank. As one of Long Island's Wild, Scenic and Recreational Rivers, the Carmans has long been a top destination for anglers. This project will open up approximately six miles of river and lake habitat for alewife, eels, and various trout species. "The Health and Science of Our Bays: A Fire Island Perspective"
Thanks to everyone who came out to the Village of Saltaire for our "The Health and Science of Our Bays: A Fire Island Perspective" public forum. We were joined by environmental and governmental experts from the United States Geological Survey, Suffolk County Health Department, and The Nature Conservancy to discuss Fire Island's water quality challenges and solutions. Governor Cuomo signed the Drug Take Back Act into law, which will help keep unused drugs out of the hands of abusers and out of our treasured water resources. This landmark bill ensures that the multi-billion-dollar pharmaceutical industry—not the taxpayers—will fund a robust, statewide program to provide all New Yorkers with convenient access to safe pharmaceutical drug disposal options. It requires that all chain pharmacies provide a safe drug disposal option for customers and allows police precincts and independent pharmacies to also participate. In July, we celebrated this victory at a press conference with the bill's champion, Senator Kemp Hannon. CCE joined CT Governor Dannel Malloy as he signed a bill strengthening the state's Sewage Right to Know Law. CCE successfully advocated for CT's Sewage Right to Know Law in 2012, which aimed to mandate that residents be notified when a sewage overflow occurs in their area. That law had fallen short in providing all residents in every community with convenient access to timely information on sewage overflows, which is why CCE fought for an improved bill this year. Now, all wastewater treatment plant operators are required to report sewage overflows electronically, making the information available to the public online. The law also requires plant operators to notify municipal leaders about sewage overflows in their communities so those leaders can take actions to protect their residents. A huge thank you to everyone who helped get this necessary public health protection law passed! Since the release of our report on widespread 1,4-dioxane contamination in Long Island drinking water last year, concerned residents have asked what personal care products put them at risk of exposure to 1,4-dioxane. This contaminant is a byproduct of manufacturing and is not listed on product labels, so CCE went to work to find the answer! We had 30 personal care products, including shampoos, bath soaps, baby products, and detergents, independently tested for 1,4-dioxane. Of the 30 products, 23 tested positive for the contaminant! To find out which products had high levels of 1,4-dioxane and learn more about our fight to protect public health and our drinking water from this emerging contaminant, check out our shopper's guide. In July, CCE's Louis Burch joined U.S. Senator Richard Blumenthal at a press conference condemning the Trump administration's plan to roll back critical provisions of the federal Endangered Species Act (ESA). For the last 45 years, the ESA has effectively helped identify and protect more than 2,300 endangered plant and animal species and their habitats. We cannot afford to lose these crucial protection measures and put our endangered species at further risk. We attended public hearings in WNY and in Albany on the NYS Department of Environmental Conservation's proposed rule to phase out the use of dirty coal power in the state by 2020! We spoke in support of these first-in-the-nation regulations and provided recommendations to make the regulations even stronger by ensuring that the retired coal plants do not repower with fracked gas. What Causes NY's Worst Cancer Clusters? Governor Cuomo has announced a new cancer research initiative focusing on exploring environmental factors that contribute to high rates of cancer in certain New York communities. The study focuses on four regions: the western part of the state surrounding Erie County, the eastern part of the state surrounding Warren County, Staten Island, and an area of Long Island including Selden, Farmingville, and Centereach. CCE attended a community meeting on Long Island to discuss the new initiative, the toll high cancer rates have taken on families and communities, and potential environmental issues that contribute to this problem locally. 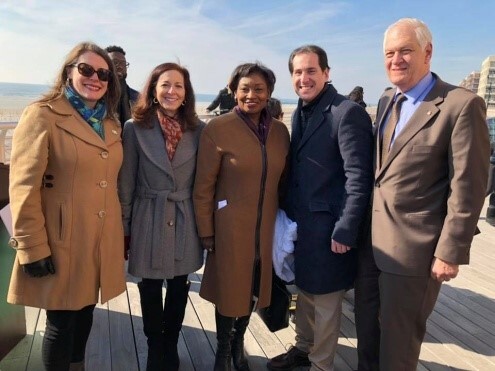 CCE's Maureen Dolan Murphy joined Town of Hempstead Supervisor Laura Gillen, Senator Todd Kaminsky, Town Councilwoman Erin King-Sweeney, and Town Clerk Sylvia Cabana to launch a living barrier reef around Long Meadow Island, off the coast of Lido Beach on Long Island. The reef is composed of tens of thousands of discarded clam and oyster shells from nearby seafood restaurants. Hundreds of mesh bags containing the discarded shells were linked together and submerged in the Western Bays to restore wetlands and encourage proliferation of oysters and clams. Fracking waste threatens our land, water, and health. To help educate municipal recyclers on the dangers of hazardous fracking waste, CCE moderated a panel discussion at the Connecticut Recyclers Coalition Breakfast Series. We joined state and local elected officials, other environmental advocates, and oil and gas industry experts to discuss the potential impacts this fracking waste poses to our communities and our environment. Canaan Lake in Patchogue was dying, overrun by invasive species and experiencing algal blooms due to excessive nitrogen pollution. The only way to restore water quality in the lake was to drain it, dredge the lake bed to remove any remaining stems and roots of invasive plants, and allow it to refill with groundwater. The first step of this process, draining the lake, has been completed. In July, we joined Suffolk County Executive Bellone, Legislator Calarco, and community leaders to announce that the County has approved the funding for the second step, dredging the lake bed. We look forward to a restored, pristine Canaan Lake for Long Island soon! Over the summer and fall, CCE is hosting a series of forums highlighting the importance of reducing nitrogen pollution from outdated septic systems and cesspools. We will be helping residents get grants to change out their old systems for new, on-site, nitrogen-reducing treatment systems through Suffolk County's Reclaim Our Water program. So far, we have held forums for Huntington and Riverhead residents and have received a great response, but community meetings aren't the only way to get out the word on this important issue. Want to help us educate the public on water protection, show off your creativity, and possibly win a cash prize? Reclaim Our Water is holding a film contest and asking residents to make short videos (15 seconds to 1 minute) on the importance of improving our water resources. First prize is $2,000! Learn more about the contest and how to enter. Upcoming: "The Health and Science of Our Bays: A Fire Island Perspective"
CCE will be co-hosting a forum titled "The Health and Science of Our Bays: A Fire Island Perspective" on August 17, from 10:00–11:30am, at the firehouse at 105 Broadway Walk, in the Village of Saltaire. It will be a discussion with environmental and governmental experts on water quality challenges and solutions. Speakers include Adrienne Esposito from CCE and representatives from the United States Geological Survey, Suffolk County Health Department, and The Nature Conservancy.